Free shipping to the lower 48 United States for this Lifetime basketball backboard. This built-to-last basketball combo comes with a 48"x30" Shatter Guard Fusion backboard made to handle rough play, and a black Slam-It rim to make those slam dunks better with spring-back action. Thick plastic backboard frame for added support. Compatible with both a Basketball Fixed-height mounting bracket and an Basketball Adjustable-height mounting bracket. Backboard Pad provides added protection against injuries. Slam-it rim that features double compression springs for spring-back action, constructed of solid steel with 1/2 inch braces and welded steel hooks. Mounting hardware is not included with these 3279 Lifetime Basketball Hoops. Major parts of the basketball backboard system are made in the United States. If using this backboard as a replacement basketball backboard for your basketball system, please contact us first to verify compatibility. We are an authorized reseller of Lifetime Basketball Goals and other products manufactured by Lifetime Products. This basketball backboard includes a backboard, rim, and net. A mounting bracket is necessary to attach this backboard to a roof, wall, or pole and is sold separately. Please contact us for any questions regarding how this system mounts and what mounting bracket to use. This Lifetime basketball backboard and rim combo have several uses. 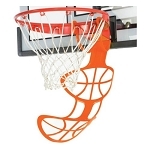 Most customers for this product either want to use this backboard as a replacement basketball backboard, others want to use it to mount to their wall, roof, or wall at home, and others want to use this backboard institutionally at a school or playground. An important design feature to note with this system is that the backboard frame is plastic. Plastic tends to have a longer life outdoors than metal; but, plastic is also weaker than a comparable steel backboard frame and is more prone to breakage. A suitable alternative to this 48 inch basketball backboard that has a steel frame is the 73729 Lifetime basketball backboard. This backboard is also 48 inches wide, but it has a steel frame instead of the plastic frame. Both of these basketball backboards are about the same price after shipping costs. Another difference between these two systems is the 73729 also has a breakaway rim, whereas the 3279 has a dual-spring compression rim; the breakaway rim is the higher-end model. We also carry a large assortment of Lifetime basketball systems. Product received. as described, Great Deal, Would buy from again! GREAT eBayer! THANKS! Nice looking and durable backboard. I am very pleased with the the backboard I purchased as a birthday gift for my son; the installation was easy, and it looks great. We have spent many hours playing since we received it 8 months ago, and it seems to be very durable. Shipping was prompt as well. good postings when I searched for "roof mount basketball"
Q: Can I purchase just a backboard and not the rim combo? 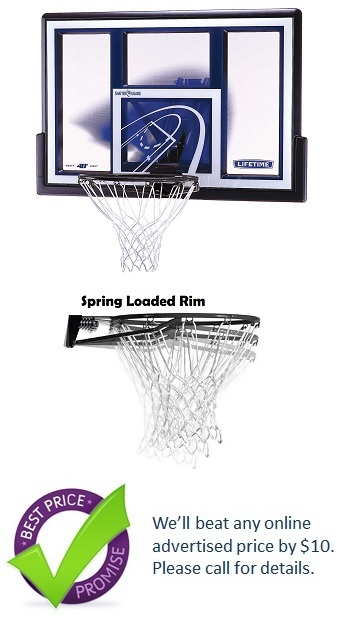 A: Unfortunately this backboard and rim combination is discontinued. We don't sell just the backboard, but we do sell backboard and rim combos. If you need further assistance please feel free to e-mail us or call us as well. Fast Shipping: Orders for the 3279 Backboard generally leave the warehouse the next business day. Dimensions: 48" x 33" x 7"